Duke Nukem has fought many enemies like giant floating brains, aliens and mutated pig cops. Yet now an even more powerful force may kill Duke Nukem for good: economics. On May 8th 2009, 3D Realms abruptly fired everyone on the team developing the ironically named game Duke Nukem Forever. 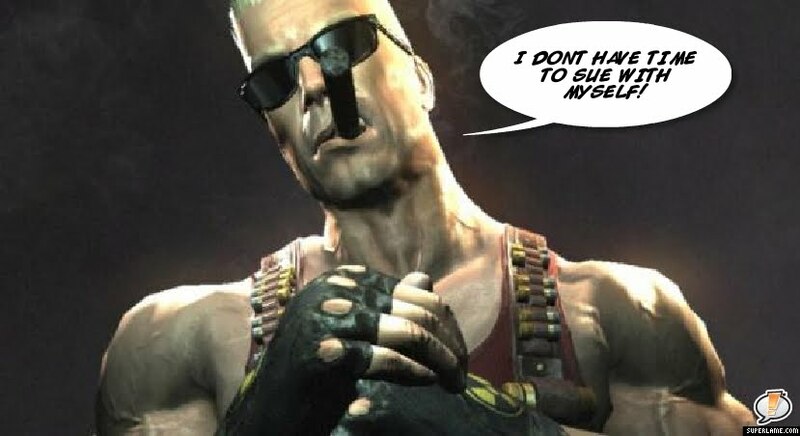 Take-Two Interactive, the company that owns the publishing rights to develop the game, is suing 3D Realms to try to rescue the twelve million dollars they put into the project. Reports of 3D Realms' clandestine off-shore accounts and wild parties drinking champagne from the bellybutton of scantily clad women abound*. As long as the lawsuit grinds its way through the court system, the character may not see the light of day on advanced consoles like XBOX 360 or PS3. But the saddest part is that Duke Nukem Forever won't be on the list of Wired Magazine's vaporware awards for its 12-year-long development time. *Sniff* I loved that joke. *We made up that last part, but it's fun to think about.